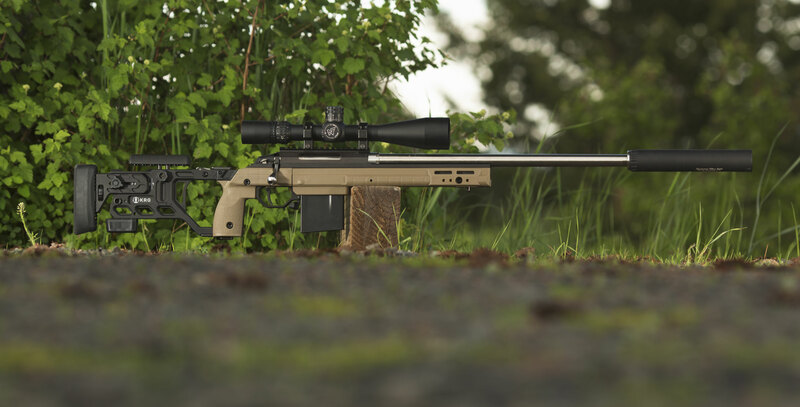 The Whiskey-3 Chassis (W3C) (Generation 5) is one of the premier chassis available for your bolt action precision rifle. The W3C combines precise aluminum bedding with tool-less adjustments, durability, and excellent ergonomics. Right out of the box it allows the use of AICS style magazines (not included) in your rifle without any special bottom metal. 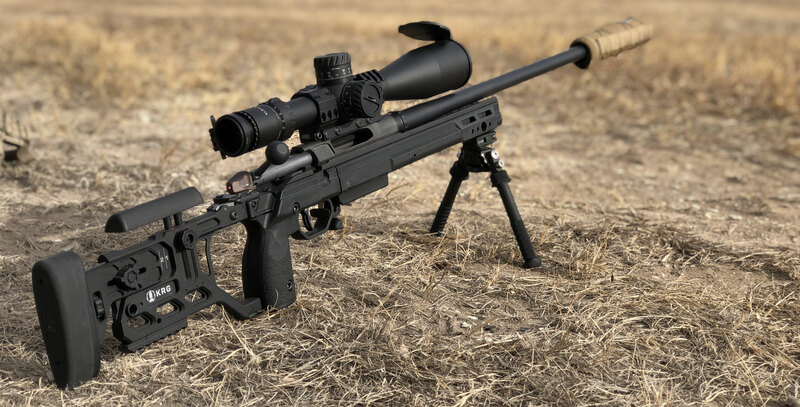 Numerous types of accessories can be added to the many attachment points, including handstops, sling mounts, rails, bipods, monopods, and more. 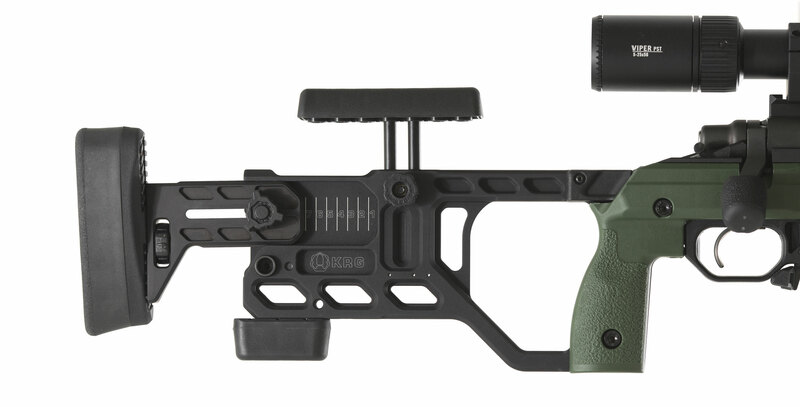 Our modular grip panels allow the shooter to tailor the fit of the stock to his/her hand which, combined with the other adjustments, yield a stock set up exactly as it needs to be for that particular shooter. Will accept any barrel contour up to 1.25” straight cylinder. 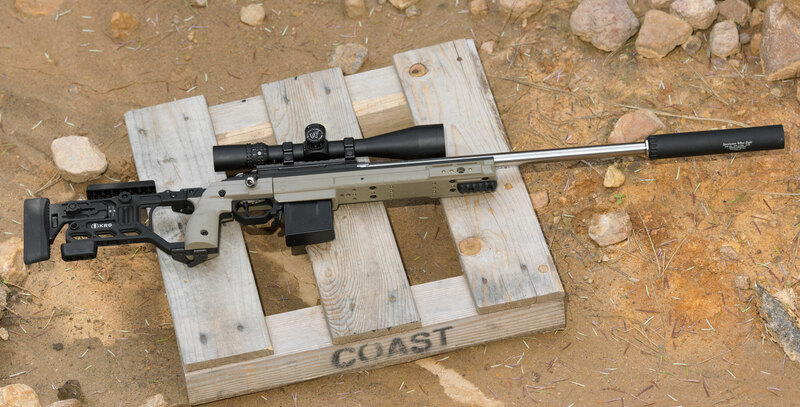 We recommend no larger than .9" at muzzle (i.e. 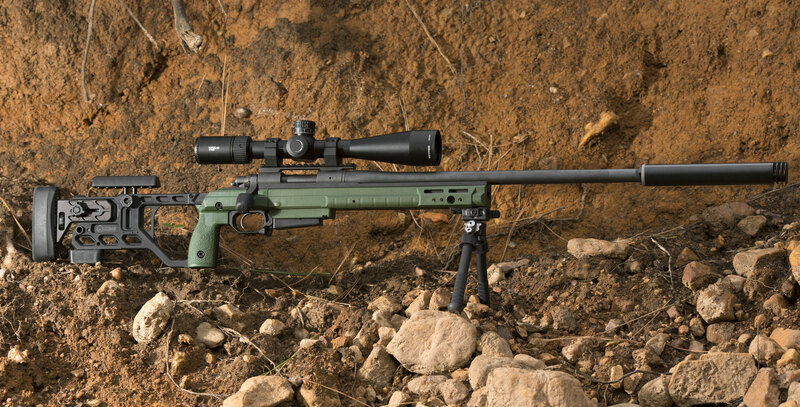 Medium Palma/Remington Varmint contour) for weight and proper overall rifle balance. 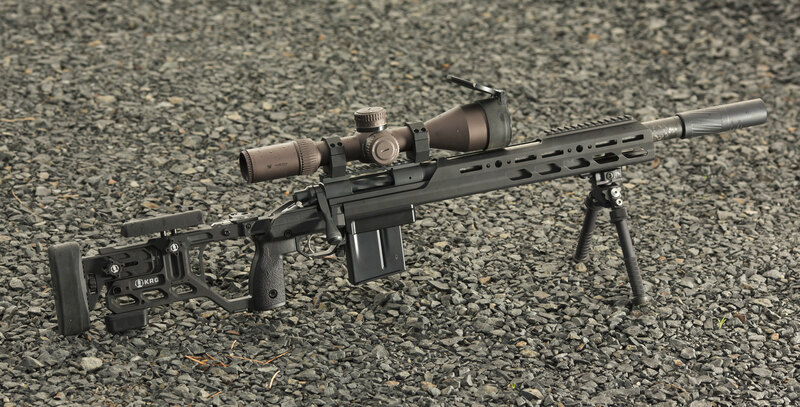 Remington 700 long action and Badger M2008/13 long action gen 5 uses AICS .338 CIP length magazines, AI part number 4808 (bend in feedlips to use with smaller cartidges like .300 WM). Fixed version is ~ 3.8 lbs w/o magazine. 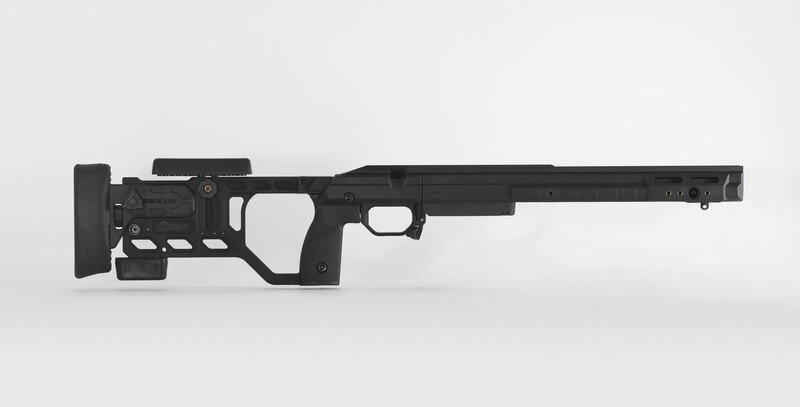 Folding version is ~ 4.1 lbs w/0 magazine. $899 fixed Rem 700SA, $939 fixed T3/Rem 700LA. Threaded mounting holes in forend in slightly different position, some are positioned to use the Magpul MOE L2 picatinny rail. Trigger guard held on by two screws now instead of one screw and a tab. No holes drilled in barrel channel on Gen II (vent holes). Grip panels are injection molded reinforced polymer instead of cast polyurethane. Cheek piece is wider, taller, and more comfortable, and also injection molded. Bag rider/Butthook is injection molded and included with chassis instead of being optional accessory. 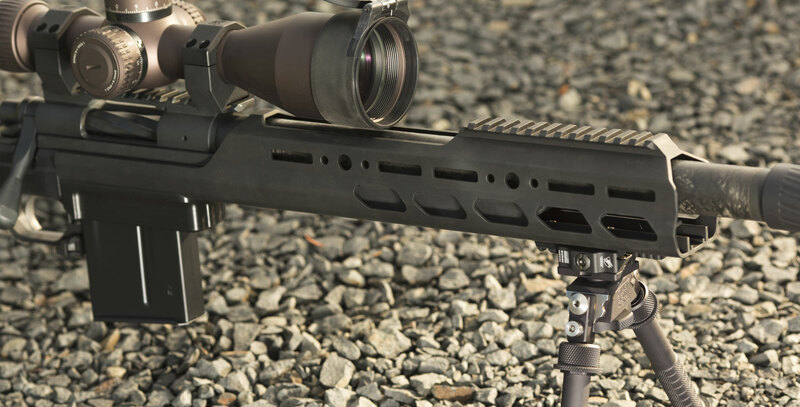 Set screw has been added to top of buttstock to lock down LOP system to eliminate any play. 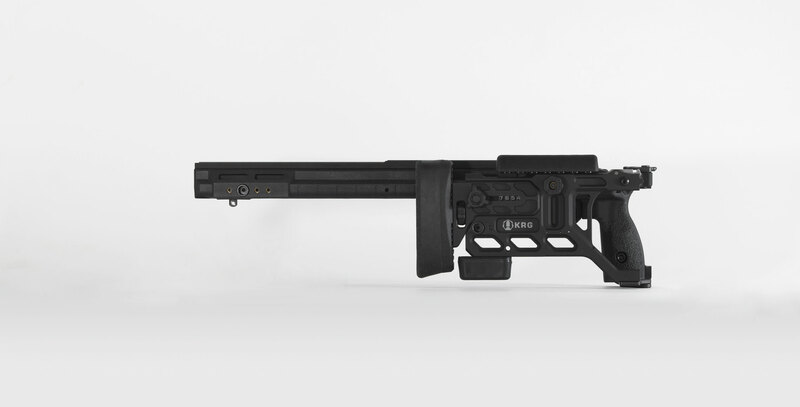 Bottom of buttstock has been modified to accept Magpul MOE L3 rail instead of L1 rail for more mounting positions, also there are two additional M5 threaded mounting points on the buttstock for more mounting options. 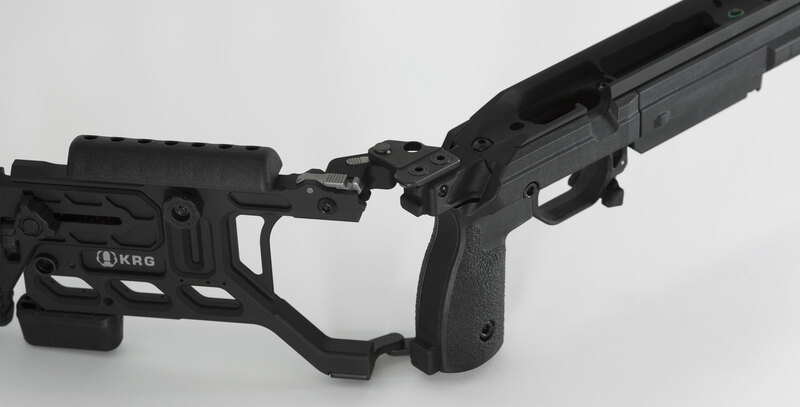 Will accept either our small grip panel option or our regular grip panels readily, whereas the Gen II stocks will require replacement of two metal components to accept the small grip panels. Fixed stocks can no longer be upgraded to a folding stock after they are purchased. 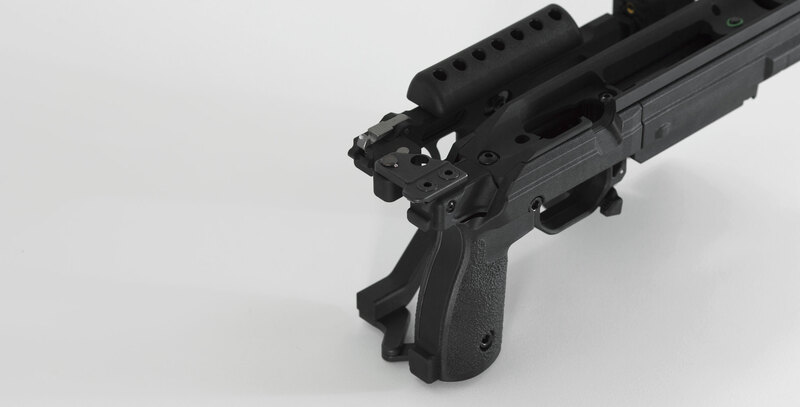 Stocks which use a .308 sized AICS magazine now have a wider trigger guard which facilitates magazine insertion and the trigger guard has a larger opening for the trigger which means some aftermarket triggers will drop in with no modifications to the chassis. 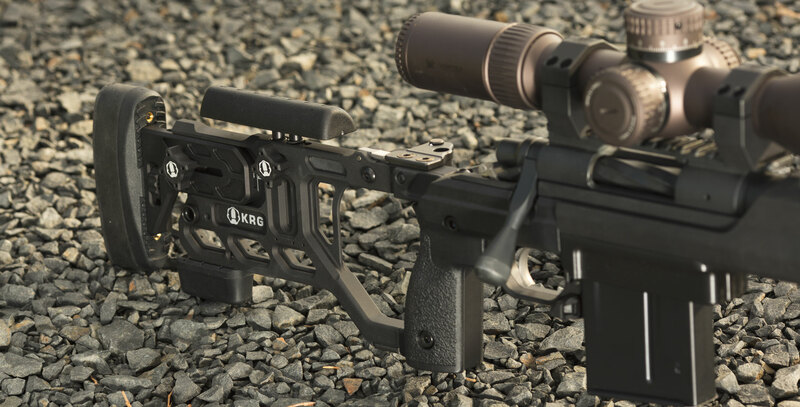 Stocks have an alternate position for the QD mount point in the buttstock as well as some new mounting positions for other types of sling mounts. Stocks have new forend mounting points that allow MOE rails and our flush mount QD sling plate to be mounted, and they retain the two hole NV mount of the Gen II. (These were included on later Rem 700 gen 2 stocks). Length of pull adjustment levers moved to right side to remove possible interference with sling. Access hole for front action screw is enlarged to allow easier access with a torque wrench (this also means the front action screw is no longer captured). Weight for the fixed stock has dropped about 5oz to 4lb 10oz for Rem 700 version..
Forends have grooves to keep Harris bipods from twisting. Front ends have mounting holes specifically meant for solid mounting of our new spigot mount. Cost has increased slightly to $919 fixed $1289 folding. Some other changes like slightly revised buttstock design. Additional mount point on side of forend to fit our sling loop (HK style loop)/QD mount. 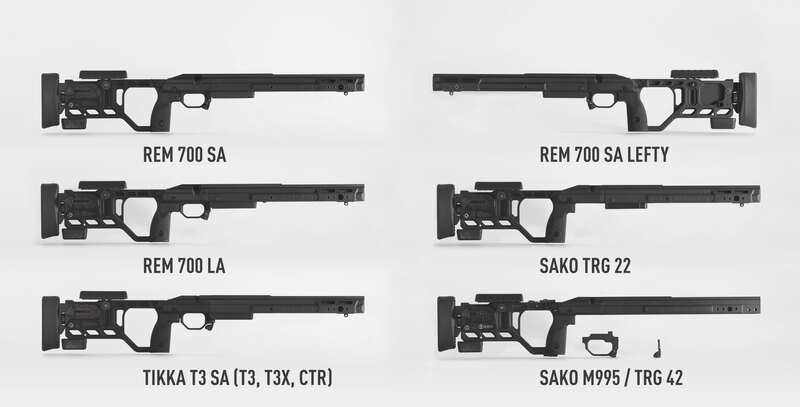 Five main components of fixed buttstock consolidated into single part. Single LOP cam with 180 degree rotation to locked position. Moved lower spar leg forward on buttstock to avoid it hitting non-trigger hand during recoil. Enlarged thumbshelf and the left side thumbshelf can now be used on the folding chassis. Added QD mount point at hinge in folding chassis to sling when folded. Simplified hinge mechanism in folding chassis. Added clearance for more aftermarket triggers in Rem 700 chassis versions. Weight has been decreased by several ounces on both folding and fixed. Slight cost increase on both configurations to $939 fixed, $1299 folding. Availability: If you are able to add the item to your cart and checkout, then we have it in stock. 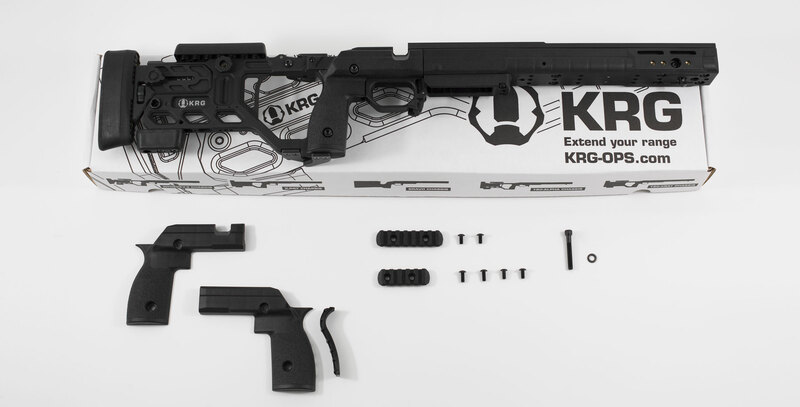 If it is shown as out of stock, please contact us at info@krg-ops.com to backorder it. If the price shows as $9,999 in the shopping cart then that means that we are shipping them to backorder customers and that there is a bit of a wait. To pre-order/back-order, please email us at info@krg-ops.com and we will place your name on the pre-order list. Shipping Fee: This item will ship for a flat rate of $25 if purchased alone. This rate will cover all other items ordered and shipped at the same time. 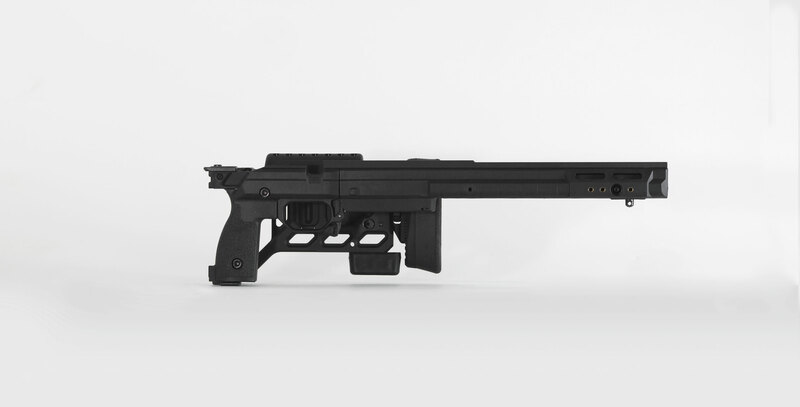 NOTE: ALL stocks comes with one each MOE L2 and L3 rail, along with the bag rider for the rear and a sling swivel stud (bipod stud) for the front. Additional rails and other accessories can be ordered in the Products/Accessories section of our website. No stocks come with an AICS magazine.